This tapestry, Santa Ana, is a detail from the larger work, La Sagrada Familia con Santa Ana, painted by El Greco or 'The Greek', a famous painter if the Spanish Renaissance. He was born in Crete and became a master artist by age 26 when he moved to Rome. 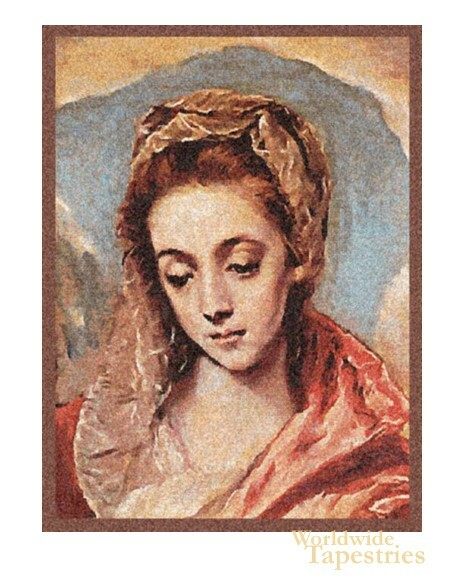 His style has an expressionistic and dramatic quality and his subjects were often depictions of religious figures including in Santa Ana, a portrayal of the Virgin. The original, completed around 1595, was a gift to the Hospital de San Juan Bautista in Toledo. This face of Mary was considered by many critics to be the most beautiful of female subjects by El Greco, and in the larger work represents the expression on Mary's face while nursing her infant. This tapestry brings forth the detail of the image by El Greco which has made him one of the most famous Renaissance painters of his time. This tapestry is backed with a lining and tunnel for easy hanging. Dimensions: W 17" x H 23"